Apparently the first Republican Talking Point on the sheet is, "I hope President Obama succeeds." Now that's almost as stupid as "Hope" and "Change." The CONTENT matters! Succeeds at what? I certainly hope, and will pray, that President Obama succeeds at preserving, protecting and defending the Constitution of the United States and seeing that the laws are faithfully executed, but as for the agenda Obama promised during the campaign, God forbid that he should succeed at that! Am I supposed to hope (because the President is new, or because he is the first African American, or because I want to seem bi-partisan) that Obama succeeds in passing and signing the Freedom of Choice Act? that he succeeds in legalizing homosexuals in the U.S. Military, where my sons may find themselves rubbing elbows with, or worse, saluting them? Should I hope Obama succeeds at appointing federal judges in the District and Supreme Courts, who regard the U.S. Constitution as a "Living Document," and may overthrow the definition of marriage? Should I hope that he succeeds in spending additional billions of future taxpayer dollars, saddling business with punishing regulation, singling-out profitable industries for punitive "windfall" taxation, un-doing the Bush tax cuts of marginal rates, estates, capital gains, dividends, investments in equipment, child-tax credit, undoing of the marriage penalty? Should I hope Obama succeeds in eliminating secret ballots in Labor Union votes? Should I hope that Obama succeeds in stiffing our courageous, democratic, terror-fighting ally, Columbia, by deep-sixing CAFTA? Should I hope Obama succeeds in snatching defeat from the jaws of victory in Iraq by a premature withdrawal? Should I hope he succeeds in shutting down our terrorist detention facility at GITMO or undoes the USA Patriot Act, that he succeeds in abandoning the collection of signals intelligence (known among Media and Democrats as "domestic wiretaps") on international phone calls to or from suspected enemies of the U.S.? Should I hope Obama succeeds at meeting with dictators and thugs who hate America and long to use the President of the United States as a propaganda foil? Should I hope Obama succeeds in further radicalizing Public Education with the anti-American and/or Afro-Centric indoctrination programs that he and a guy from his neighborhood promoted through the Annenberg Challenge? A good way for Republicans to begin crawling out of the post-election bunker might be by specifying what we mean when we wish President Obama success, namely that we wish America success, which will be best accomplished if Obama FAILS to deliver on his planned agenda. When images like this are displayed on the news, they should always be accompanied by The Temptations singing, Smiling Faces. Illinois Republican(s) For Burris 2009? 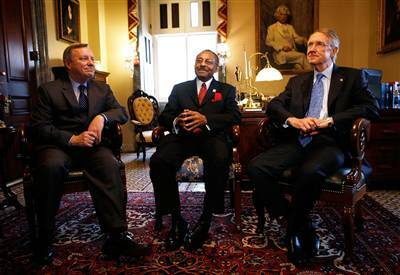 The U.S. Senate has no Constitutional authority to refuse to seat a duly appointed Senator, and that’s what Roland Burris (see: Democrat Hack) is. Blago is the Governor, invested with the authority, by Amendment 17 and Illinois Statute, to fill the Senate vacancy, which he did by selecting Burris. The fact that Blago is charged with crimes and facing impeachment doesn’t alter his authority unless and until he is removed from office. The U.S. Senate is empowered by Article 1 to judge the qualifications of its members,* not to arbitrarily invent the qualifications. The qualifications are specified in the U.S. Constitution, so the U.S. Senate has the power to determine whether Burris is 30+ years old, a US Citizen for the past nine years, and a resident of the State of Illinois. As far as I know, no one is claiming that Burris is actually a resident of Kenya, so Harry Reid and Co. are obliged to swear him in. While it is tempting to wish for a protracted Democrat self-destruct fest, Conservatives value the integrity of our Constitutional Republic above tactical political advantage. That’s one of the things that differentiates us from the Competition (see: Democrat Party), so this would be a good moment for some Conservative Republicans to stand up for the Constitution, with the ancillary benefit that Harry Reid et al. are currently caught off-base, standing, as it were, in the Senate Chamber Door, in the great Democrat tradition of George Wallace, to exclude a Black man from their domain. The moment of opportunity is passing quickly as Senate Dems will shortly fall into line for Obama, who just wants the matter to go away – yesterday -- and Republican skittishness will probably carry the day, meaning no GOP elected officials will leave an imprint on the public discourse in defense of the Constitution; notwithstanding that all Senators raise their right hand and swear to defend it. *the U.S. Senate is also empowered by Article 1 Section 5 to judge the election results of its members, and the Democrat majority will no doubt do so with cynical dereliction in the case of the Minnesota election, by seating Al Franken. So much for supposed Democrat angst over stolen elections, eh? It’s a priceless image: Harry Reid, returning to his Democrat Roots, standing in the Senate door to keep out a Black man. That’s the Democrat Party's version of the "Big Tent" strategy: George Wallace, welcome home; Roland Burris, we don’t serve your kind.